Air Lease Corporation (ALC) announced today long-term lease agreements with Belavia-Belarusian Airlines for four new CFM LEAP-1B25-powered Boeing 737-8 MAX aircraft scheduled for delivery in 2019 and 2020. The first aircraft will deliver from ALC’s order book with Boeing in May 2019. The new MAX 8s will join the other Boeing 737s including the growing fleet of Boeing 737-800s (top). 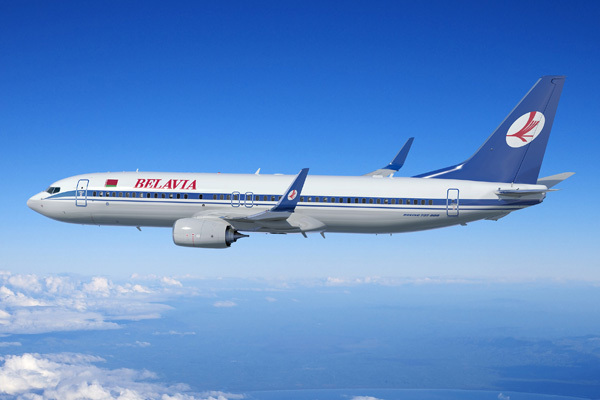 “Belavia-Belarusian Airlines is systematically continuing to implement the strategy of the fleet renewal, thanks to cooperation with such reliable partners as ALC. The acquisition of four next-generation aircraft on a lease will contribute to the further development of the airline and, consequently, to the improvement of the quality of passenger service,” said Anatoly Gusarov, Director General of Belavia-Belarusian Airlines. “We hope that the delivery of the Boeing 737 MAX will allow our passengers to start travelling only with positive impressions and will make flights as comfortable as possible,” continued Anatoly Gusarov. The new aircraft will help the carrier to retire its older Boeing 737-300s and 737-500s. Top Copyright Photo (all others by Belavia): Belavia Belarusian Airlines Boeing 737-8ZM WL EW-456PA (msn 61422) AMS (Karl Cornil). Image: 938677. This entry was posted in Belavia Belarusian Airlines and tagged Belavia Belarusian Airlines, Boeing 737-8ZM WL, EW-456PA, msn 61422 on July 17, 2018 by Bruce Drum. Nordic Aviation Capital (NAC) has announced that it has committed to lease five Embraer aircraft, three E195s and two E175s, to Belavia Belarusian Airlines, the largest carrier in the Republic of Belarus. The placement of the five new aircraft are from NAC’s existing Embraer order book. The delivery of the first three aircraft, two E195s and one Е175, is expected as early as April 2019. The remaining two aircraft will be delivered in December 2019 and in April 2020, respectively. The transaction is an essential part of Belavia’s fleet growth initiative which will allow them to successfully implement their strategy on growth and ensure cost-effective development. 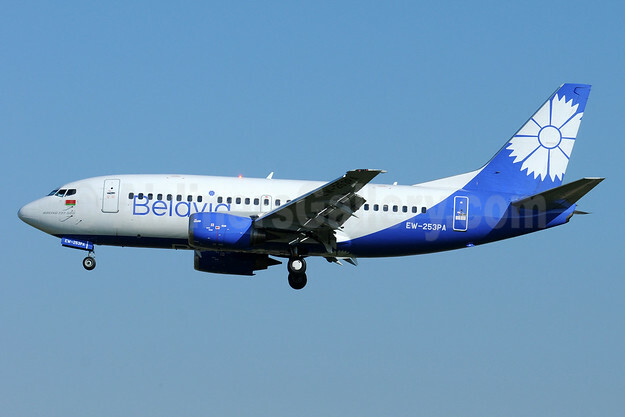 Top Copyright Photo (all others by Belavia): Belavia Belarusian Airlines Embraer ERJ 190-200LR (ERJ 195) EW-400PO (msn 19000668) AMS (Ton Jochems). Image: 922995. This entry was posted in Belavia Belarusian Airlines and tagged Belavia Belarusian Airlines, Embraer ERJ 190-200LR (ERJ 195), EW-400PO, msn 19000668 on April 9, 2018 by Bruce Drum. On April 26, 2018, Belavia will start operating flights on the Minsk-Kazan route. The flights will be flown four times a week with a departure from Minsk at 11.50 p.m. on Tuesdays, Thursdays, Fridays and Sundays and arrival at the Kazan International Airport the next day at 2.10 a.m. Return flight from the capital of Tatarstan is planned with departure at 4.30 a.m. on Mondays, Wednesdays, Fridays and Saturdays with arrival at the Minsk National Airport at 6.50 a.m. The time for all airports is local. The 2018 FIFA World Cup is coming, that is why the opening of the Minsk-Kazan-Minsk flight will let fans from European countries get an additional opportunity to arrive in Kazan with the greatest comfort and the least time costs,” – said Director General of Kazan International Airport JSC Alexei Starostin. The flights are planned to be carried out on board of a comfortable Embraer 175 airliner with passenger capacity of 76 seats. Travel time takes about 2 hours and 20 minutes. The carrier is also starting the Minsk – Rostov-on-Don route on April 27. 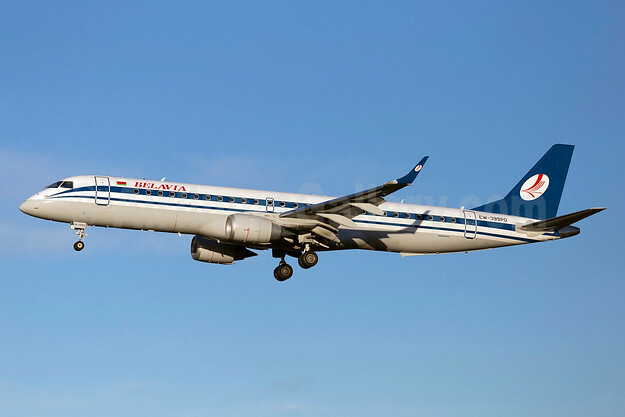 Top Copyright Photo (all others by Belavia): Belavia Belarusian Airlines Embraer ERJ 170-200LR (ERJ 175) EW-340PO (msn 17000350) LGW (SPA). Image: 938679. This entry was posted in Belavia Belarusian Airlines and tagged Belavia Belarusian Airlines, Embraer ERJ 170-200LR (ERJ 175), EW-340PO, msn 17000350 on January 17, 2018 by Bruce Drum. Belavia’s flight B2 8243 operating from Minsk to Kiev on December 22, 2017 reportedly with the pictured Boeing 737-3Q8 EW-336PA (msn 26312) reportedly left the payment after landing on runway 18L at Kiev. The passengers and crew members safely evacuated the aircraft. It is unclear at this time if the surface was the runway or the taxiway. More information to follow. The airline has not put out a statement. Top Copyright Photo: Belavia Belarusian Airlines Boeing 737-3Q8 EW-336PA (msn 26312) AYT (Paul Denton). Image: 909060. This entry was posted in Belavia Belarusian Airlines and tagged Accident, Belavia Belarusian Airlines, Boeing 737-3Q8, EW-336PA, Kiev, msn 26312 on December 22, 2017 by Bruce Drum. The pictured EW-455PA was delivered on August 13, 2016. “The new livery is the result of a collaborative effort between Belavia, Boeing and the design firm Teague. Before creative concepts were drawn, Boeing’s Airline Partnership Marketing team and Teague provided guidance and training through a series of brand workshops. The logo was inspired by the cornflower (“Valoshka” in Belarussian), which is a national symbol of Belarus– representing beauty, friendship and prosperity. 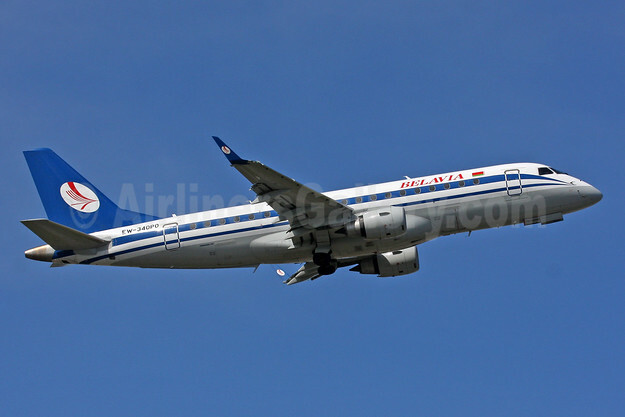 Copyright Photo: Belavia Belarusian Airlines Boeing 737-8ZM WL EW-455PA (msn 61421) BFI (James Helbock). Image: 934262. This entry was posted in Belavia Belarusian Airlines and tagged Belavia Belarusian Airlines, BFI, Boeing 737-8ZM, EW-455PA, msn 61421 on August 14, 2016 by Bruce Drum. 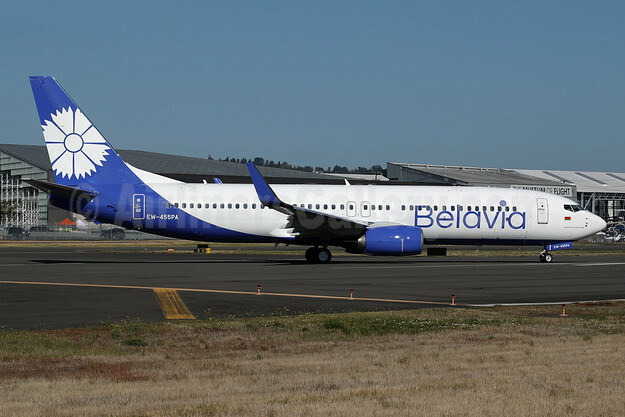 Belavia Belarusian Airlines (Minsk) is getting ready to take delivery of its first Boeing 737-800 (737-8K5 EW-437PA, msn 27988, ex D-AHFP) leased from AerCap. Previously on June 26, 2014 Belavia announced it had reached an agreement with Boeing on an order for three 189-seat Next-Generation 737-800 airplanes. 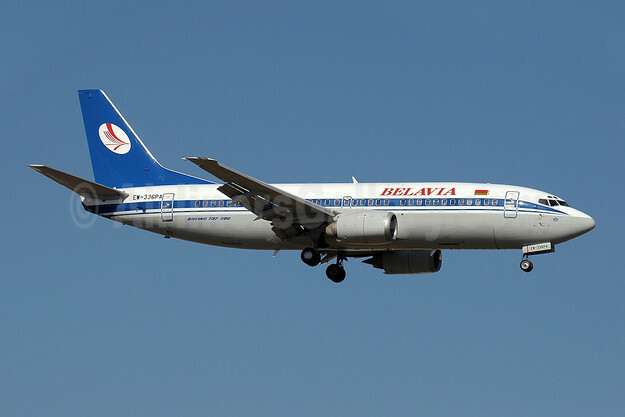 Belavia currently operates six Boeing 737-500s and seven 737-300s. 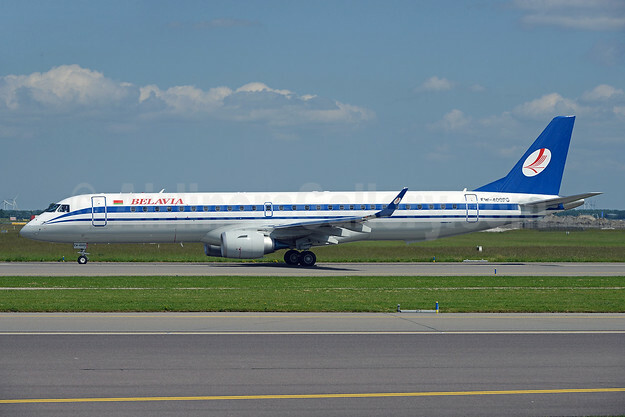 Belavia is planning to initially operate the new type on the Minsk-Barcelona route starting on May 16, 2015 per Airline Route. 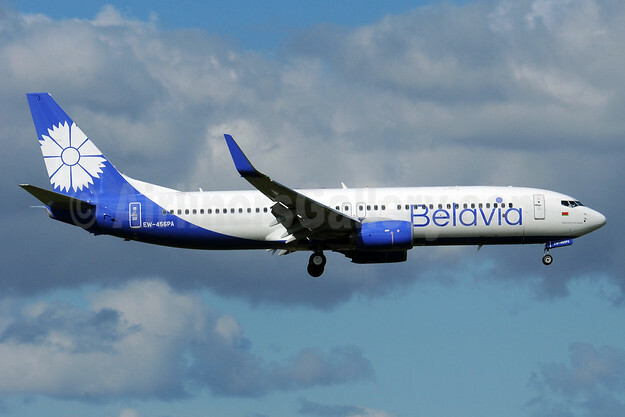 This entry was posted in Belavia Belarusian Airlines and tagged -437PA, 27988, 737, 737-800, 737-8K5, AerCap, Barcelona, Belavia, Belavia Airlines, Belavia Belarusian Airlines, Boeing, Boeing 737, Boeing 737-800, minsk, Minsk-Barcelona on December 13, 2014 by Bruce Drum.